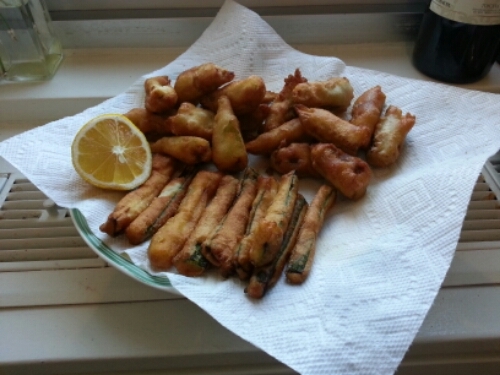 Fried artichokes and zucchini, with beer batter. Cut the zucchini in half length wise, and then again in half across. Then slice lengthwise, and discard the center part with the seeds, keeping the green side. to make small zucchini sticks. Clean the artichokes, discard the dark green per leaves, discard the tip, and the outer part of the base. Cut each artichoke heart in four and keep it in cold water with lemon juice to keep them from darkening. Mix flour and beer with a whisk, add the oil and let it rest for 30 minutes at room temperature. Mount the egg whites, and add to the batter. Add the salt. Heat the peanut oil in a deep pan, about 10 inches in diameter, on a high flame. When the oil is hot, pat dry the vegetables, put them in the batter 15 pieces at a time., and one by one on the hot oil. Do not fry too many pieces at once otherwise the temperature of the oil will decrease. Put each batch of fried vegetables on a plate covered with kitchen paper, to absorb any excess oil, and add salt.